Despite a meeting convened on Wednesday by the Guyana Elections Commission (GECOM) to discuss issues pertaining to the Commission’s readiness for the upcoming elections, there has not been any progress thus far, according to People’s Progressive Party (PPP) Commissioner Robeson Benn. Speaking to the local press following the engagement, the former PPP Government Minister said a lot of time was wasted on Wednesday as he dubbed the meeting unproductive. According to him, the timelines for training of polling agents were discussed but no decision was taken. It was suggested during the meeting that trainers and evaluators undergo 14 days of intense training, but Benn said he objected to that proposal, explaining that it could be done in two days instead. “Sixty-five days for training of staff and evaluators? You don’t need this time. Over 5000 of these same people, just over two and half months ago did the same thing. So, there is no need for full gamut of training,” the Commissioner said while arguing that this again is another tactic to delay things. Benn said it is apparent that the intention is to lose enough time of the 90 days beyond March 19. He reminded that the voters’ list remains valid until April 30, and while the Government parties continue to argue that new names will need to be added, this could be done by way of simple registration, and through the Claims and Objection period, as was catered for at the recent Local Government Elections. As it relates to having proper financing to carrying out a General and Regional Election, Benn said while there are finances for house-to-house registration, based on the no-confidence vote, that will no longer be necessary since the list is still valid and the monies could be otherwise utilized to conduct the elections. While it was discussed during the previous meeting of Commissioners that there will be a need for additional funding to undertake elections, the PPP-appointed Commissioner explained that Chief Elections Officer Keith Lowenfield has not reported back on the advice he sought on the issue. However, Benn maintained that it is normal for statutory Government agencies to have finances wired. He said GECOM has done it in past elections and he sees no difficulty why it cannot be done now. The PPP-appointed Commissioner said there have been refusals, unwillingness or non-appearances to come to decisions from some commissioners, among other issues. “And despite us saying on January 22 that the Commission must prepare for elections, as mandated by the Constitution based on the no-confidence vote, we are still to be told whether they would be in an election mode,” he added. 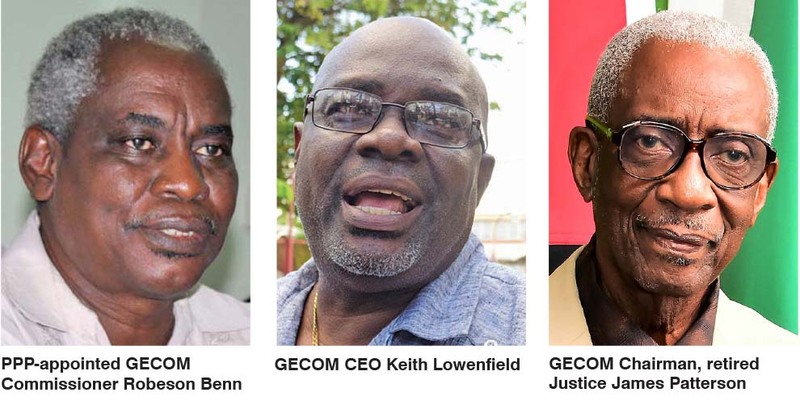 Benn is convinced that GECOM has taken certain actions in line with an overall strategy geared towards not having an election on March 19, 2019, which was related to the Carter Center during their visit. When questioned as to whether he thinks a vote should be taken on the current stalemate, Benn said is for the Chairman, retired Justice James Patterson to decide on. On the other hand, Government-appointed Commissioner Vincent Alexander said there was nothing new to report, except to say that Benn had a presentation before the Commissioners. The next meeting is scheduled for Tuesday, February 19, 2019. The parliamentary Opposition has pointed to Government’s attempts to delay the holding of the constitutionally mandated elections following the no-confidence resolution of December 21, 2018. The three-month time frame in which the polls should be held was validated in the interpretation by acting Chief Justice Roxane George, who declared that the motion was validly passed 33-32. GECOM has since been unforthcoming about its preparedness for the mandatory elections despite being mandated by the Constitution of Guyana to hold elections within three months of the passage of a no-confidence motion. In fact, during a meeting with both Opposition and Government Chief Whips, the Chairman of GECOM, retired Justice James Patterson abruptly ended a meeting on the Commissions preparedness after he was pressed for answers. Already international pressure on the country has mounted. Only recently, United Nations (UN) Resident Coordinator, Mikiko Tanaka urged the State to demonstrate its integrity and respect the Constitution as she reminded that building a peaceful and just society requires respect for the rule of law and confidence in national institutions. Her calls were followed by similar sentiments by other members of the diplomatic community.